Bring socks for the rope climb practice. All sessions are in the new gym, 47 Clarence St.
A very, very BIG thankyou to everyone that came to help move the gym today. We are so grateful for the support. That was a huge job that was made easy by so many people willing to spend their day cleaning, painting, lugging gear and doing the many hundred things that needed to be done. A very special thanks to Shane who tirelessly worked all day getting the mats in place despite having a fall off his bike on the way to the gym ... mate, you are amazing. Special thanks also to Ian, Micah and Darren who have been so generous with their time and skill over the last weeks. We simply could not have gotten by without you guys. Thanks to Tiff and the super all-girl cleaning crew; Alex, Amorica, Viggi and the 9:15am all-stars; Timmy for beavering away all day with an ear to ear grin; and so many others ...too many to all name individually, but thankyou all ... you have blown our minds and we love you guys. This is YOUR new gym ... enjoy!! This WOD will be the first in the new building ... 47 Clarence St, Coorparoo! Due to the relocation of equipment to the new building. 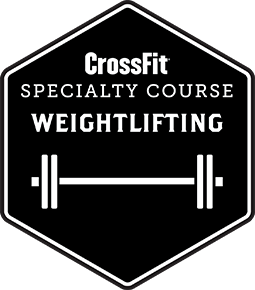 we WILL NOT be holding a weightlifting session tonight (24/6/2011) All other classes are running as per normal in 39 Clarence St. Weghtlifting sessions will resume as per Monday 27/6/2011 in the new building.